An event titled "Moon-viewing Party" is under way at space No. 5 on the fifth floor of the main building of Mitsukoshi's flagship store in Nihonbashi. Here is a photo of the event. 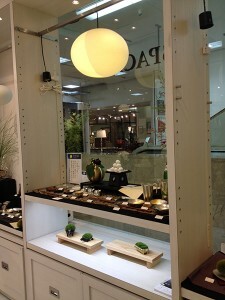 Set up near the escalator is a stage named "Taketori Monogatari," where our Mokumoku-Pendant (L) and other items are exhibited. To the left of the escalator, they have a space for a moon-viewing drinking party. 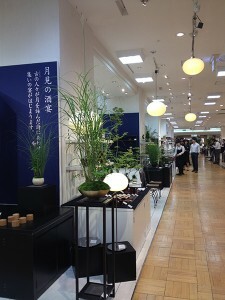 The pendant, tablestand and floorstand lamps of our Moon series are shown here and there with products of Nousaku Corp. Looking at the photo, is there anything you notice? Each Moon lamp is designed so that half of it lights brighter than the other half. Depending on the direction from which it is seen, the lamp looks like a crescent moon, half moon or full moon. The lamp can also be seen from the side of the escalator. From this angle, it looks like a crescent moon. 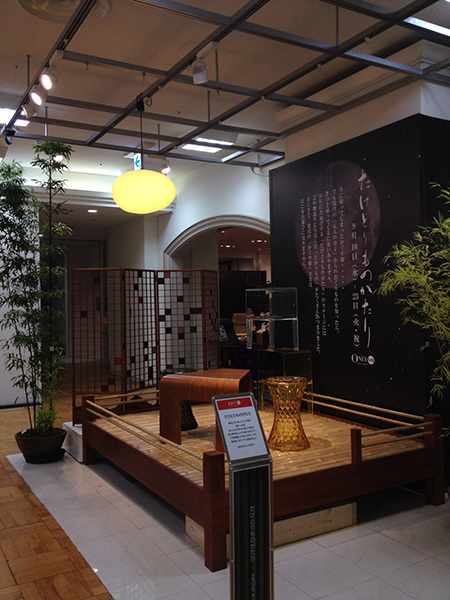 The Moon-Pendant (SP) is on display at the center of the exhibition space. This is a rare extra-large lamp. 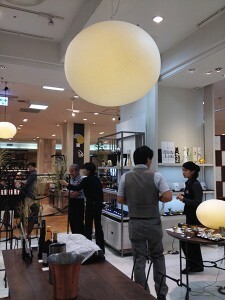 The Moon-viewing Party event runs through September 23 (Tuesday and holiday) on the fifth floor of the Mitsukoshi Department Store in Nihonbashi. Come and see this fabulous event. It gets really cold in the morning and at night these days. This morning, the temperature in Tottori was 15 degrees C. I was curling up in the bed. Now, here's some good news. Kongobuji, the ecclesiastic head temple of Koyasan Shingon Buddhism, is now open for nighttime visitors. 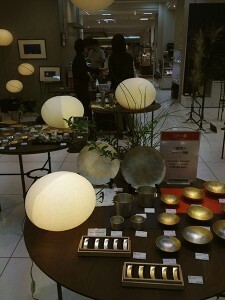 At the invitation of Mr. Hiroshi Nagane of Tokyo Design Party, we have offered our Moon lamps to be used for the nighttime lighting of the temple. This is a limited-time event that runs through October 31. Why don't you go and enjoy the nighttime lighting at the temple?